The white washed walls are finished. The three back-band pieces are glued and nailed together, I then joined the front mantle to the side pieces with a biscuit and glue. This time we were smarter about it and focused on getting the colors balanced and getting the pieces to generally fit together. 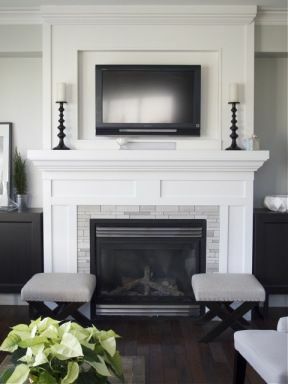 The stacked stone is by Eldorado Stone in the Chapel Hill finish, the fireplace is a Montigo L42 with a stainless steel frame, the customized mantel was built by JReal and a 55″ frame less ultra-thin Samsung TV was hung above the mantel. A few coats of wipe-on polyurethane and we have the shelves ready to go in. Now we just have to finish the walls.